Most of the emails that swamp my inbox daily are deleted immediately, though occasionally there is a free ticket offer or a chance to make friendship bracelets out of chocolate. (Thanks, Office of Student Affairs!) But the best news I’ve heard lately came from a Juilliard administrator. The subject, in all-caps: $5 MILLION GIFT FOR MAP. MAP is the Music Advancement Program, the Saturday music program at Juilliard where I’ve been teaching for the last two years. MAP serves to represent the under-represented in the American classical music scene – which means most of their students are black and Hispanic, and the tuba player is a girl! The program came close to ending in 2009, when it lost major funding. But thanks to Harriet Heyman and Michael J. Moritz, MAP, which was started in 1991 by Juilliard president Joseph Polisi, has become so much closer to becoming fully endowed. I’ve been coaching Claudius and Juliet in the Bach Double. Their accompanist is Hongsup Lee. 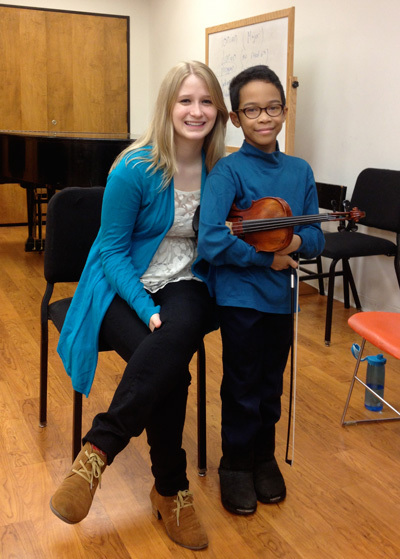 As a MAP Fellow, I work with students in chamber music and in private lessons. 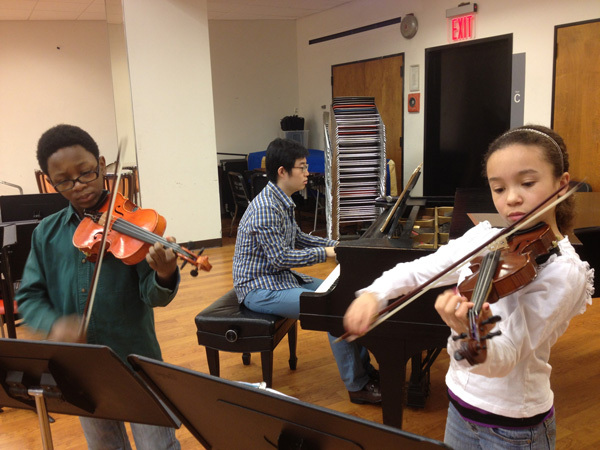 Herbie, my 9-year-old student from Queens, is perpetually bouncy and enthusiastic – even at the dreadful hour of 8:30, when we have our weekly lessons. Herbie is working on the second movement of the Handel violin sonata in D major, and is preparing it for a recital this month. Herbie recently left school because, even though he had skipped two grades, the work wasn’t challenging him. On his iPad case, he has written in sharpie: “I am home-schooled, not a truant”, next to a drawing of the 1 train. He likes the subway system very much. I invited Herbie and his mother to one of my orchestra performances at Juilliard this year (Mahler’s 1st symphony, with Edward Gardener conducting). Herbie sat on the edge of his seat throughout the concert, taking careful notes. At the end of the symphony, he leapt to his feet and clapped his hands over his head while jumping up and down. He was probably the only 9-year-old in the audience, and certainly had as much enthusiasm as the rest of the audience combined. 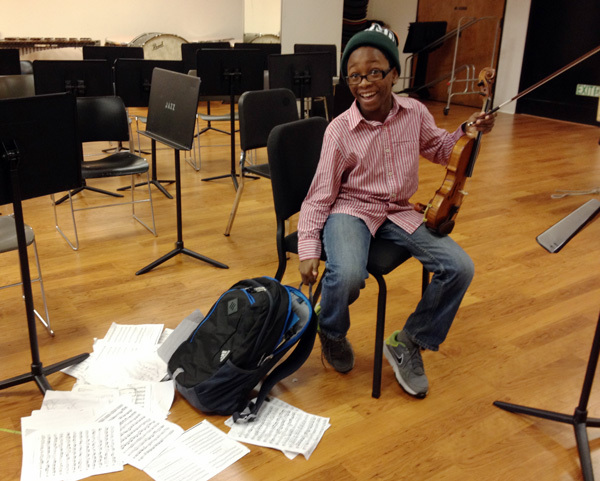 Students in MAP receive weekly private lessons, take theory classes, and play in an orchestra. Most of the MAP parents are very supportive, but some determined students make it there every Saturday morning without much parental involvement. Claudius has a LOT of music to learn! Attending a program at Juilliard is a big source of pride for the students and their families. The program has an extremely dedicated staff and faculty, and in spite of all the bleak news in classical music, it’s comforting to know this program will be educating and nurturing young musicians for years to come. The Music Advancement Program application for the 2013-2014 year is available online at http://www.juilliard.edu/map. The deadline is April 1st.